The final award is one selected by the director only. Jeff Baldwin and I have worked together for 25 years. We have worked for each other, helped each other, and I call him a friend for many reasons. I have much respect for his work. You could have knocked me over with a feather when I heard my name called as the recipient of this award. The award is presented to someone whom the director feels makes special contributions to the production. I am honored and touched. 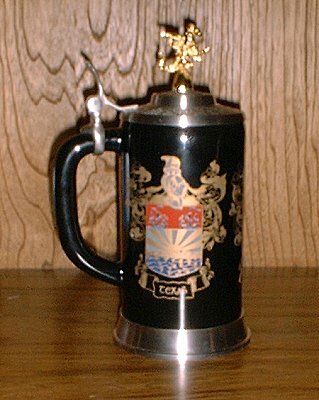 The award is signified by the tankard in the picture below. Philip Hafer joined the Texas Renaissance Festival in 1978, as the Lord Mayor. Philip was a skilled actor when he had a script, but he was not accustomed to working impromptu. However, as he remained with the Festival, first as a member of the Royal Court, then as various characters in the Robin Hood show, and finally as King Henry VIII, he grew as an actor and performer. He reached a point reached only by a great actor. He became King Henry. Philip passed away in 1992, and this award was instituted by David Casey in his memory. I knew Philip well, and was touched by his passing. Now, this award will be on permanent display in my home as a remembrance of Philip and the Texas Renaissance Festival. It was a pleasure to work with all of these dedicated performers. They are more than friends, they are part of my extended family. Many of them start out as accountants, stevedores, teachers, firemen--people with what most of us consider everyday jobs, but they embrace the fantasy of the Texas Renaissance Festival and become characters in a truly wonderful play. They come in to the festival site for eight weekends every summer, work on their characters, work out the scenarios and teach one another how to do this great thing that they do. They bake in the hot sun, walk kneedeep in the mud, and practice in the peak of the summer heat. Then, in October and November, they perform their parts, as professionally as any theatrical company anywhere in the world, for seven weekends. I pay them the highest compliment that can be paid an actor--friends, you are troupers! All pages on this site © Bill Palmer. All rights reserved. For permission to republish contact Bill Palmer at the above e-mail address.